Insulated Can Coolers, also called Koozies or Bottle Chillers, insulate your beverages in a collapsible sleeve keeping your drinks cold and your hands warm. 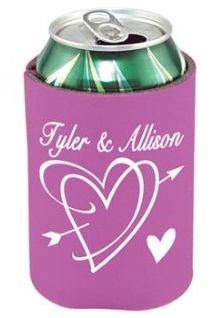 These custom imprinted can or bottle cooler koozies can be carried in your pocket. 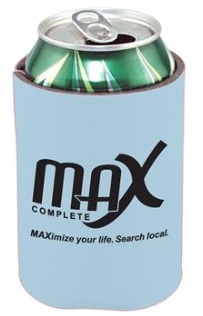 Your personalized message can be imprinted on can or bottle coolers for a low advertising cost. Our low prices make us a favorite for wedding favors, reunions, small parites and other events. Give us a Call or Text at 706-258-7041 for Customer Service, Design Assistance and a FREE Quote. We have many years of experience ready to assist you. Patented Custom Coolie collapsible beverage insulator made of open cell foam - durable polyester covered scuba foam. One inside seam offers the largest advertising space available. Can coolers fold flat for storage, holds 12-16 oz cans, longnecks, water bottles and sodas. Great bottle cooler, can fridge, wine cooler, hand held can sleeve that keeps cans and bottles cooler and hands warmer. 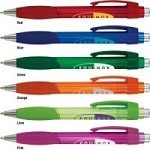 Price includes a 1-color puff ink imprint on 1-side, 2-sides or wrap - same price. If you need your imprint on both sides, be sure to let us know! On Camouflage and Pink Camouflage, add $0.10 per piece to prices listed above. 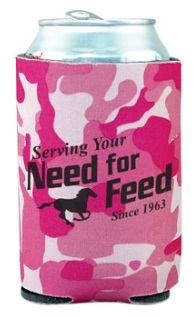 Insulated Can Coolers Imprint Area is 3-1/2" h x 3" per side. Wrap imprint area is 3-1/2" h x 7". Call or Text us at 706-258-7041 for multi-color imprints on Custom Can Coolers or see our Full Color Can Coolers. Wrap not available for multi-color imprints.